Nature is an important element of a Montessori education. When you watch a seed grow into a flower, you get to witness one of the many miracles of nature. In the same way, seeing something you nourish with the proper nutrients develop into something beautiful is exciting and gives you a sense of accomplishment. At Montessori Academy at Sharon Springs, our outdoor garden allows our students to experience these feelings daily. A great way to incorporate these environmental principles of a Montessori education outside the classroom is by creating your own garden at home. By creating a small garden in your yard with your children, you can share these joyous feelings with your little ones and expose them to the wonders of nature. While there are dozens of different crops that can be planted in a backyard garden, it is a good idea to choose crops that are easy to grow, grow relatively quickly, and are fun to harvest. In this way, children do not lose interest in the garden because it is taking too long for it to grow. One of the best crops for a child to grow is a sunflower because it begins sprouting in one week, and once it is taller, it will grow hundreds of seeds that can be eaten or replanted. Not to mention, the vibrant yellow color of the flower’s bloom is beautiful to look at every day. Lettuce and snow peas are other great options because they grow quickly as well as deepen a child’s appreciation for vegetables. Many children tend to love cherry tomatoes and carrots because they are particularly fun to harvest and eat! 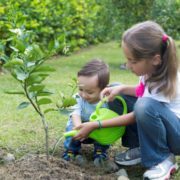 In order to make gardening a fun experience for your child, there are several things you can do. Give your child their own gardening plot or put them in charge of a particular crop. This will keep them engaged, as they will feel responsible for their section of the garden. Giving your child real gardening tools instead of the plastic one made for kids is usually a better idea – as long as you are supervising – because the plastic ones break easily and often frustrate the child. This also makes your child feel that their work in the garden is just as important as yours. Instead of buying garden starters, you should begin by planting real seeds. This will help your child gain a better understanding of a plant’s life cycle and feel a greater sense of accomplishment once they harvest their crop. Lastly, you can help your child build a scarecrow for the garden. This is especially useful if your child starts to become bored with gardening, since it will help regain their interest in protecting their crops. There are several important virtues of a Montessori education that your child will learn from gardening. Growing a crop does not happen overnight; it requires patience, dedication, and hard work. A child will learn that they must continue taking care of their crop in order for it to grow. They will enjoy seeing it blossom as it goes through different stages of its life, but they must continue nurturing it in order for it to fully grow, bloom, and produce fruits or vegetables. Children will also learn responsibility and ownership through an at-home Montessori education involving the environment. If they are put in charge of growing a particular crop, that crop becomes their responsibility and they will feel a sense of ownership over it. Once it is fully grown and harvested, they will feel proud that their hard work created something useful for their family. Studies have shown that children who garden are happier and more confident in their abilities.